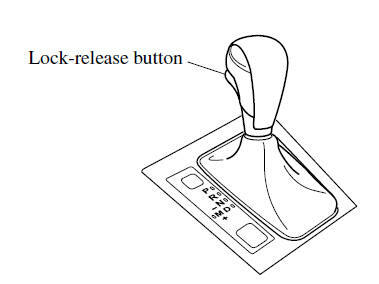 pedal and hold in the lock-release button to shift (The ignition must be switched ON). The Sport AT has an option that is not included in the traditional automatic transaxle that gives the driver the option of selecting each gear instead of leaving it to the transaxle to shift gears. Even if you intend to use the automatic transaxle functions as a traditional automatic, you should also be aware that you can inadvertently shift into manual shift mode and an inappropriate gear may be retained as the vehicle speed increases. If you notice the engine speed going higher or hear the engine racing, confirm you have not accidentally slipped into manual shift mode.